Automobile manufacturers initially sold cars to wealthy families. The automobiles were expensive and uncommon because the production of the vehicles was labor-intensive and took a long time to produce. Henry Ford changed the way cars were built by moving from individual teams that required the time and expertise to build a car from start to finish, to a process that automated the assembly line with people owning individual tasks along the assembly line. We have reached this inflection point in the world of IT operations. The central purpose of the IT infrastructure is to make applications and data available, reliably and securely. Unfortunately, the management and day to day operations of the IT infrastructure has become a complex process that is hard to successfully coordinate. Technologies have advanced to the point where specialized skills are needed to understand and manage the day-to-day operations of many IT components. Application delivery and security are two critical disciplines that are associated with all aspects of network operations. The growing complexity of these functions requires advanced expertise and they are hard to maintain. The processes used to manage application delivery and security services are often complex, manual, skill-intensive, and prone to human error. 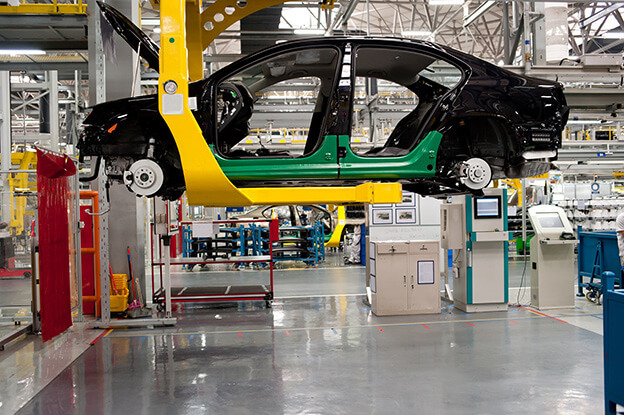 This is what Henry Ford saw when he revolutionized the industrial production models. He saw an opportunity to leverage technology and processes to streamline operational tasks. Businesses are looking for solutions to simplify and streamline their management tasks. Tools are needed to simplify the operational management of the different technologies and solutions. Any task that is performed more than once, on a regular or irregular basis, can be defined in a tool and automated. For example, the operational management of SSL certificates is time consuming and prone to error. A large business may own several hundred or thousands of SSL certificates. Each certificate has a limited lifespan. This means that the operations team needs to look at every device that contains SSL certificates and their expiration dates. They may reside on application delivery controllers (ADC), firewalls, application servers, proxies, and other components. The process to manually check SSL certificate validity is repetitive, time-intensive, resource-intensive, and highly prone to human error (forget to check a device, accidentally skip over an expiring certificate, etc.). This type of operational task is a prime example for one that should be automated and simplified using Henry Ford’s principals. A script or tool can be created to understand the location of all the SSL certificates and go out and regularly check their status to send a report to the operations team. When a new instance of an application needs to be deployed, traditionally, the operations team needs to manually configure and deploy the application server, the application delivery controller (ADC), firewall, web application firewall (WAF), etc. There are a lot of parts and they all need to be configured and installed in coordination. This is a complex process that requires a lot of different skills and tight coordination. Henry Ford’s automobiles incorporated many different parts (suspension, wheels, body, engine, etc. ), but he found that there was still a standard process to build the components and put them together to create a fully functional product that met the business’ requirements. Workflows can be created by combining different technologies and solutions to fulfill an application delivery or security requirement. Virtualization, software-defined data centers, network functions virtualization (NFV) and other architecture-changing technologies are forcing us to change the way we manage our IT infrastructures. The next major evolutionary change in information technology is the development of mature and robust orchestration and automation tools to simply and coordinate the increasingly complex and intertwined technologies. 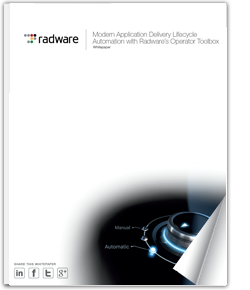 Read “Simplify and Automate Application Delivery Lifecycle with Radware’s Operator Toolbox” to learn more. Next PostInternet of Things or Internet of Threats?